From the Biddys collection by Westland Giftware. Biddys Bingo Queens Coffee Mug. This Item is in stock and ready to ship. 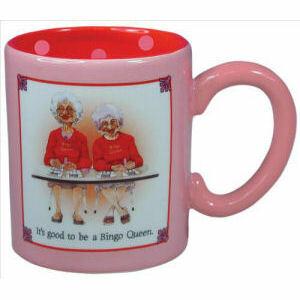 You should not postpone your purchase and miss out on adding Biddys Bingo Queens Coffee Mug to your Biddys collection! From the Biddys collection by Westland Giftware. Biddys are the hilarious counterpart to the Coots Collection. These little ladies with big hats and bigger attitude are proving to be the most popular gift item for women. Biddys are a side-splitting testament to the glory of the over-the-hill babes! Westland Giftware Biddys Coffee Mugs shipping from Canada. No Surprise Border fees or Customs!